What is the best – and the worst – about our Bajan tourism product? 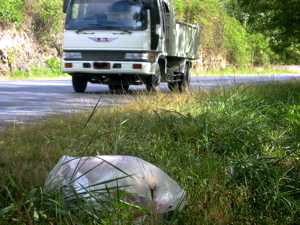 Typical Bajan wildlife in its natural roadside environment: The not so rare Genus "plasticus baggis trashisus"
I think everyone agrees that changes need to be made and need to be made urgently. What are the best things about the Barbados tourism product? What do we do really well that our visitors cannot stop raving about when they go home? What is it that we have/do that nobody else anywhere has/does that is currently translating into massive foreign exchange? How do we make that more prominent in the world? Once we’ve identified those key areas then how do we duplicate this success in other parts of the island? How do we improve this product by getting the stakeholders (Hoteliers, Government, Workforce, Citizens) involved in the process in meaningful and sustainable ways?